The effect of incomplete education is profound, and when we asked one 62-year-old man what he thought the greatest threats to the future were for his community, he did not have confidence in his own experiences, noting, “What can I say? I am not read [educated].” Through a partnership of the University of Central Florida (Orlando), The Hollings Centre for International Dialogue (Washington DC and Istanbul), and the High Atlas Foundation (Marrakech), we recently conducted field work in the High Atlas Mountains, speaking with the people there who poured their hearts out to us. 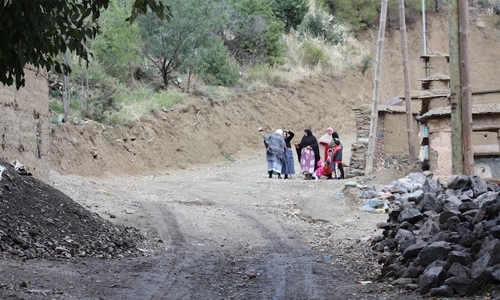 The most consistent message we heard from the people of the High Atlas was that the future hinges on water. One group told us that when things are good, it is because the rain is abundant and on time; things are very hard otherwise. They are worried that climate change will affect if the rains come, or that the rain will not “come in its time.” They have good reason to worry because climate change is expected to decrease precipitation significantly, reducing streams, lakes, and groundwater. Drought is a constant worry. The World Bank estimates that 37 per cent of the population works in agriculture, meanwhile production of cereal crops varies wildly due to annual variation of precipitation-- and 2018 was thankfully a bountiful year. Climate change will make the people of the High Atlas Mountains much more vulnerable while they are already living on the edge of survival. They feel that Moroccan society is deeply unfair—there is no help for the sick, little support for education, little defence against the cold, and that, for some, corruption is the greatest threat to a sustainable future. Consequently, civil society has an important role in achieving the SDGs. The High Atlas Foundation has been working to help people in this region to organise themselves into collectives that decide both what the collective wants, and pathways to achieve those goals. Women have organised into co-ops that they own and they collect dividends from their products together. People in one coop lobbied the 2015 Conference of Parties climate meeting in Marrakech. Men’s associations have developed tree nurseries that not only produce income, but which protect whole watersheds – and therefore some water for the future. They are also participating in carbon sequestration markets. In this regard, the Marrakech Regional Department of Water and Forest provides them carob trees and the authorisation to plant these trees on the mountains surrounding their villages. However, perhaps the most important element of these collectives is that they give each person in them a voice. Leaders of these collectives have formal rights to approach the regional governments about their needs, and this voice would not be heard at all without the formal collective organisation. These organisations cannot replace government services, but they do add capacity to the community. Not only do these collectives lend people some influence over their current and their children’s lives, they love each other and they are not struggling alone. We witnessed profound solidarity. Repeatedly, the collectives told us “We love each other, we are one family,” “We are like one,” “We help each other,” and the conviction that “I will be with you.”The world is decidedly on an unsustainable path, so If we are going to meet SDGs, all the people like the people of the High Atlas Mountains must matter and their voice deserves to be heard. Will far-right hijack of EU elections finish off liberal democracy?